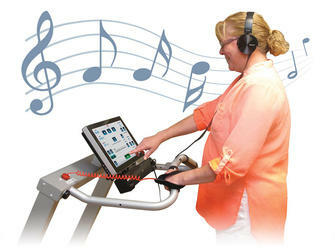 Music compositions combined with gait training technology brings music-based therapy to the plan of care. Because You Believe in Better Patient Outcomes…Music-based therapy is well researched for its powerful effects in treatment of movement disorders. With the rate of Parkinson’s, stroke and cerebral palsy diagnoses on the rise, so is the need for better treatment options. We equipped the Biodex Gait Trainer 3 with informed compositions written and performed by music therapists to help more patients find their stride using the power of music. This revolutionary music integration provides an effective tool for physical therapists, occupational therapists, and neurologists to enhance treatments and drive faster outcomes. The advanced technology built into the Gait Trainer 3 documents progress, proving the value of treatment. With our exclusive instrumented deck, realtime biofeedback and sophisticated analytics, the Gait Trainer 3 is the ideal platform for integrating music-assisted therapy. 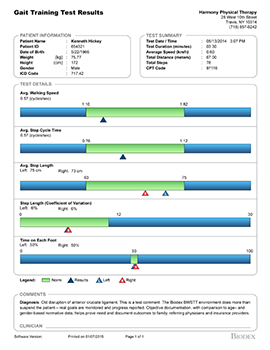 Using the Gait Trainer’s intuitive interface, belt speed can easily be adjusted to match the patient’s steps per minute (spm). Music tempo in beats per minute (bpm) can be managed to influence gait components. 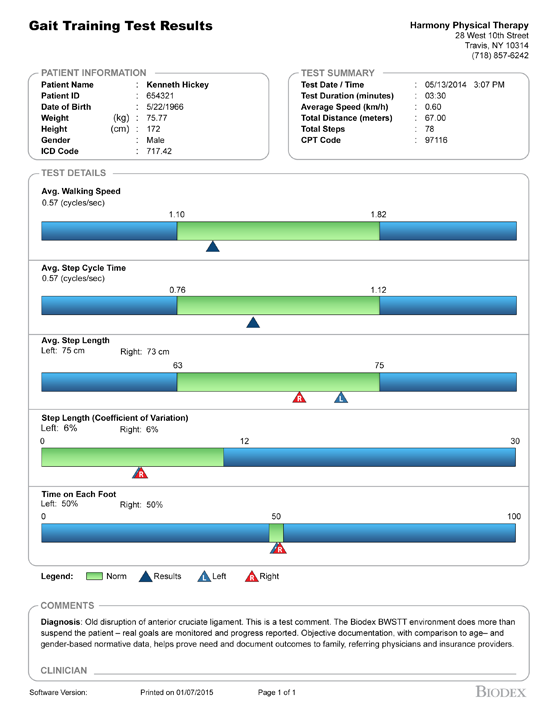 Biofeedback quantifiably displays step length, step speed (spm) and step symmetry to encourage patient progress. Fit the music to the patient. Select the correct tempo (bpm) to accommodate patient’s step speed or steps per minute (spm). While the repetition of gait training encourages lasting effects through neuroplasticity, informed music is composed to facilitate correct movement. The Gait Trainer includes compositions created by music therapists that can be adjusted to a range of bpm without degrading music quality – even accommodating lower bpm for late stages of Parkinson’s. Genre-preferred music can also be downloaded from the internet and tempo-adjusted (bpm) to an individual’s walking speed (spm). need, progress and outcome of the therapy. 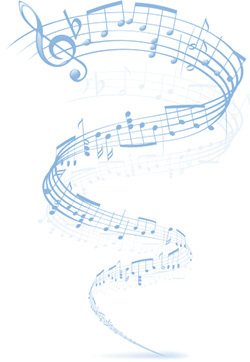 Those affected by debilitating neuropathologies respond favorably to Rhythmic Auditory Cueing (RAC) and musical elements carefully chosen to enhance functional movement. Music is shown to jumpstart the brain’s neuroplasticity, reorganizing neural pathways to help patients regain motor function that had been lost to brain injury or disease. Fitting the music to the patient synchronizes gait for entrainment. Walking can be aligned with rhythmic auditory cueing to improve temporal (velocity), special gait (stride length) and gait symmetry (left/right stride deviations). The qualitative component of what is done musically is quantified and documented by the system's computer. The pretest, comparison to normative data, and posttest results are presented objectively. 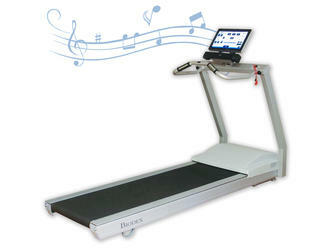 The Music-Assisted Therapy Package offered for the Biodex Gait Trainer 3 is accessed via USB flash drive that activates the music player software. A library of therapist-informed compositions, as well as various metronome beats and tones are provided. 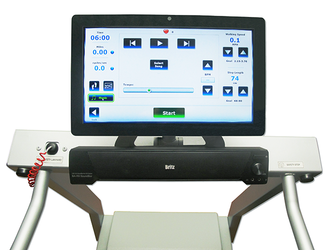 For those clinics fortunate to collaborate with a music therapist, the Gait Trainer 3 also accommodates custom recordings. The Music-Assisted Therapy Package contains a library of recordings produced at historic and internationally renowned studios, known for high commitment to sound integrity and technological excellence. Locations include Premier Studios, New York City, NY, where industry artists such as Madonna have recorded, and Bismeaux Studio, Austin, TX, which has seen the likes of Ray Benson and Asleep at the Wheel, Willie Nelson, George Strait and many others. These songs are in 4/4 time signature, with distinct, consistent down beat, without the confusion of non-complementary instrumentation for gait training. Street Walking© and Animals Everywhere© were recorded in DXD format as is used in SACD, (Super Audio CD) for Full Analog Bandwidth. Silvery Moon Medley© is an original arrangement from The Center for Music Therapy, Inc.
Street Walking© and Animals Everywhere© are original compositions from The Center for Music Therapy, Inc.